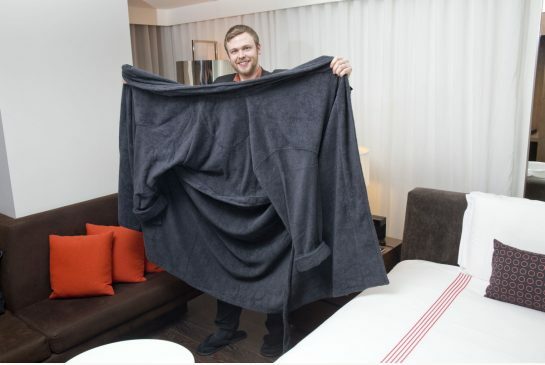 Tent-sized bathrobes and huge slippers are being provided on request for NBA giants close to seven feet tall at the Thompson Hotel in Toronto for the NBA all-star weekend. The hotel has prepared over-sized garments catered to the likes of LeBron James. On request, they’ll provide guests who wouldn’t fit regular-sized bathrobes with a size XXXXXL bathrobe and slippers. The NBA’s players association appears to have commandeered the entire 102-room hotel. The Thompson’s lobby bar has a new 60-foot video screen for the games, and the hotel’s diner has been told to fill up on poutine and the specialty St Lawrence Market sandwich. To accommodate players, the hotel’s rooftop bar is also being converted into a private VIP lounge, fully stocked with a huge allocation of Remy Martin Louis XIII cognac priced at $3,100.